Every organisation has a benchmark for its success which highlights its affluence, hard-work and prosperity – that leads to each employee’s well-being and consequently exceeding client expectations. 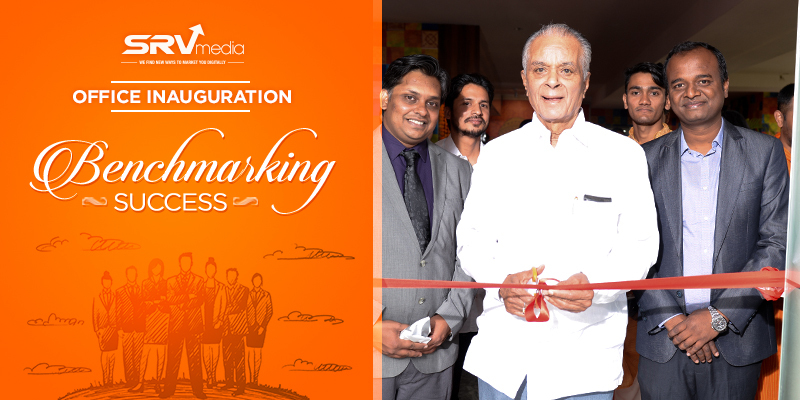 One such milestone for SRVMedia was the Inauguration Ceremony of the new office. Immersed in delight and blossoming with joy, was every employee of our office. The vibe, fused with a twist of sweet fragrance of crushed marigold and the vibrant and bold colours of rangoli, styled by our own employees, was as gratifying as it was glaring. The ceremony kicked off with our Human Resources Manager, Mrs. Neha Bhonagiri, welcoming everyone. Present at the ceremony were our eminent clients, all of our SRV family, and our distinguished Chief Guest, Dr. S.B. Mujumdar. This was followed by warm words of inspiration by our co-founder and Sales and Planning Head, Mr. Vikram Kumar. He spoke about the inception of SRV and the motivations for embarking on this business venture. He spoke to us about how a start-up in 2011, SRV has emerged as one of the biggest names in the industry in such a short span of time with a workforce of 90+ highly skilled employees. He also made a note of the contribution of Symbiosis International University, where he graduated with an MBA degree along with his co-founder, Mr. Rohit Prasad. Not limiting to this, the contribution of Symbiosis Society extends to our workforce with around 40 of our employees being their alumni. Moreover, the first client of SRV and now over 30 of our clients come from the Symbiosis umbrella. He, thus, communicated the importance of SIU in the journey of SRV, after which he felicitated our guests. This followed cordial, heartening and motivating words from Dr. S. B. Mujumdar, our Chief Guest for the occasion. Dr. Mujumdar, who is the Chancellor and Founder of Symbiosis International University and a Padma Bhushan and Padma Shri recipient, is a inspiration, not only for our founders, but all of the SRV family. As he graced us with his presence, the ambience was not only auspicious, but also encouraging. Next came the Award Ceremony which felicitated our most deserving, diligent employees for the various skills and capabilities that have shaped our organisation. The ceremony concluded with Mr. Rohit Prasad giving us the immediate anticipations of our organisations, its future goals and a vote of thanks. Next story Search engine optimization (SEO) – What is it all about? Previous story 3 things you NEED to know about content in 2018!